Mr. Rohit Sharma is a 35 years old well-settled healthy person. He works in a reputable bank and his wife Priya is 30 years old and also a teacher in a private school. This couple has two children; a 10 years old son and a daughter who is 5 years old. Mr. Sharma has been in search for a health plan that will cover all his family members. As far as health insurance products that are available in India are concerned, the best choice for Mr. Sharma is a family floater plan. However, there are scores of such plans available offered by eminent general insurance houses. Each health cover has some merits and demerits. After going through a few policies , Mr. Sharma fianally realised that comparison is the best way to cherry-pick the best health plan for his entire family. So, he resorted to one of India's best insurance comparison portal, GIBL to compare various family floater plans. While making comparison, Mr. Sharma made up his mind about two things. Firstly, he would for higher sum insured and secondly he would consider only top 3 policies with lowest premium. From his previous research he learnt the fact that if he goes for higher sum insured the premium amount will also go up accordingly. So, he started with Rs. 10 lakh sum insured and finally to Rs. 15 lakh to see the difference in premium. He didn't opt for co-pay option for both comparisons. The top 3 policy quotes Mr. Sharma got are from providers like Star Health, Religare, TATA AIG when he chose the sum insured Rs. 10 lakh. When he increased the sum insured amount to Rs. 15 lakh the top 3 family health plans he got hold of are from Star Health, Religare and Cholamadalam. 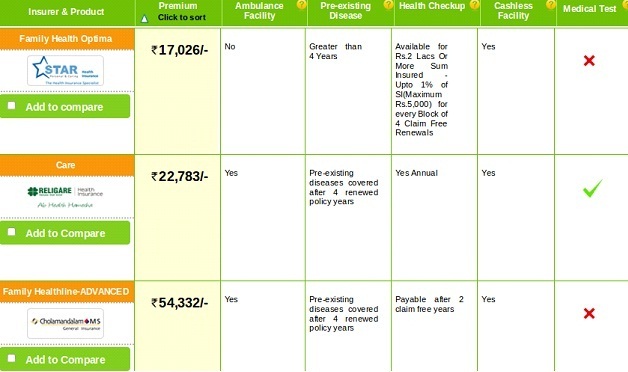 Among these 4 different insurance providers he finally shortlisted two common insurers that provide plans both for Rs. 10 and 15 lakh sum insured. One is Family Health Optima by Star Health and Care by Religare. When Mr. Sharma obtained all data and figures of these two family floater plans. He found it lot easier to understand which policiy is more beneficial. He compared these two policies on the basis of some major parameters. The premium amounts for Family Health Optima plan by Star Health are Rs. 14, 370 and Rs. 17,026 for sum insured Rs. 10 lakh and 15 lakh respectively. This means Mr. Sharma has to pay just Rs. 2656 (17026 – 14370) to obtain a family health plan with higher sum insured. But, the premium amounts for CARE plan by Star Health are Rs. 17592, and Rs. 22,783 for sum insured Rs. 10 lakh and 15 lakh respectively. This means Mr. Sharma has to pay Rs. 5191(22783 – 17592) for a plan with higher sum insured. The comparison clearly shows Mr. Sharma has to pay almost double to increase the sum insured amount from Rs 10 lakh to 15 lakh. if he goes for CARE plan by Star Health. So, premium-wise Family Health Optima plan by Star Health is lot more preferable for him. Cashless facility is available in both plans. However, ambulance facility is not available in star Health's Family Health Optima plan. Hence, Care plan by Religare is better as it offers both ambulance and cashless facilities. For Rs. 10 lakh sum insured a pre-policy medical test is required for those who have pre-existing diseases. For Rs. 15lakh sum insured medical test is required. The condition imposed by both plans for pre-existing disease is pretty similar. Both plans cover such ailments after 4 continuous renewed policy years. So, Mr. Sharma has nothing to choose between these two plans. When it comes to free health check – up policy buyers look for a policy that provides such facility. The Care plan by Religare offers free annual health check-up without any condition. The other plan also provides this facility but it comes with conditions. The maximum amount will be 1% of Sum Insured for every 4 renewed and claim free policy year. The facility is available only for sum insured amount Rs. 2 lakh and above and upto Rs. 5000. Evidently, The Care plan by Religare looks more attractive to Mr. Sharma as this plan allows health check-up without any condition. Most policy buyers look to steer clear of medical tests when they search for a health plan. Family Health Optima plan by Star Health doesn't require such tests for both Rs. 10 and 15 lakh sum insured. The Care plan, on the other hand, do require applicants to undergo medical tests for sum insured Rs. 15 lakh. Mr. Sharma would be more happy with Family Health Optima plan by Star Health because this plan doesn't require such tests. Mr. Sharma has done all the hard work to unearth to best family floater plan for his family. He delved deep into each of the two policies and found out the strength and weaknesses of both family health plans. 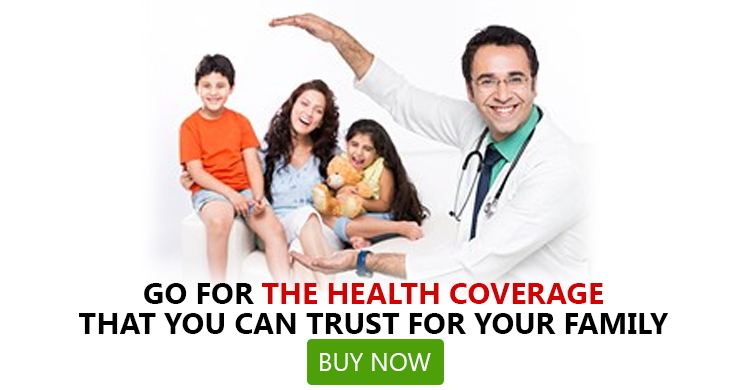 The Family Health Optima plan by Star Health is advantageous in two aspects like premium and medical test and the Care plan by Religare is also beneficial in two aspects such as ambulance and cashless facility and health check – up. Finally, Mr. Sharma selected the Family Health Optima plan by Star Health over the Care plan by Religare. Low premium was one of his chief criteria and he has found that in this plan. Moreover, the plan doesn't conduct medical tests and offer cashless facility as well. Although, the other two benefits like ambulance facility and free health check-up are missing in this plan, Mr. Sharma was fine with that thinking the low premium will make up for these additional expenses. Hence, parameters play an instrumental role in determining the best health plan. All policy buyers should not neglect these aspects of health covers and purchase a plan solely based on premium. How Should You Plan Health Insurance For Your Family? 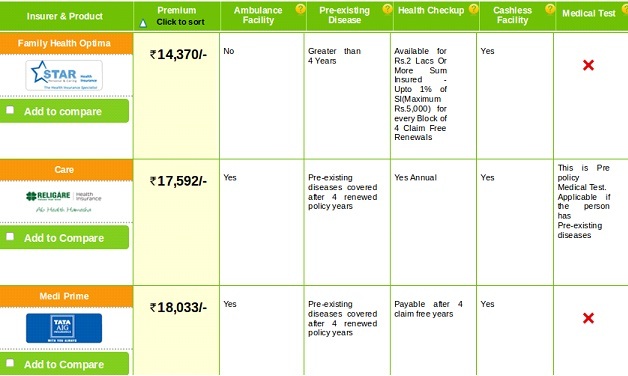 Why New India Assurance Health Insurance is a Wise Choice?